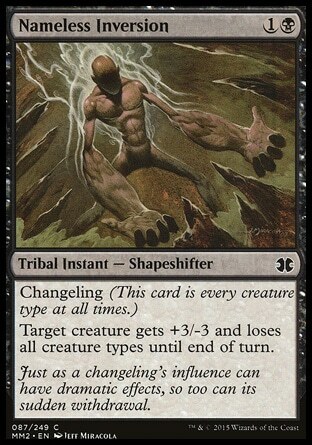 is it possible to use haakon, stromgald scourge to cast shapeshifter tribal spells? Does having Nameless Inversion on the stack count as controlling a dragon for Silumgar's Scorn? Nameless Inversion is a legal killbot in your hand, and she doesn't specify "creature card from hand." With Mary in play you can activate her ability using inversion from hand. The issue is that an instant can't exist as a permanent. It comes down to house ruling. I've read where one player used the inversion to bounce her and put inversion in the graveyard. I don't think I get your question HerzogMacabre. If you mean switching her with the actual card Nameless Inversion as it's being cast, there's no house rules about it; Mary O'Kill explicitly only switches with Killbots on the battlefield. If you mean switching Mary on the field with Inversion in hand, you can't do that either, as the reminder text describes switching as a process performed only between two creatures. As to your first question, sadly I have yet to get a chance to build this in paper. I know this is a year old now, but do you still run this? What is your house ruling for swapping Nameless Inversion with mary? I remember trying to find an official ruling on this months ago and still can't find anything. JKRice on Gifts!? ... Forrrr meeee?? I love modern gifts, probably my favorite deck out there. 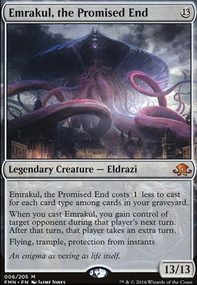 Also: I personally think Collective Brutality is a must, since it gains back all the life you lose from fetch-shocking and it lets you discard your reanimator targets. However, a lot of people disagree with me, so it might not be the best choice. I live 4c color gifts! It’s probably my favorite deck. 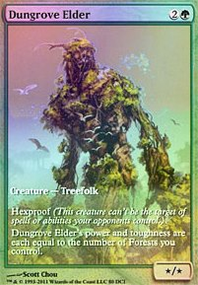 I have a few suggestions and actually a few questions about whether certain cards are viable. 7: do you think Crucible of Worlds could be any good? 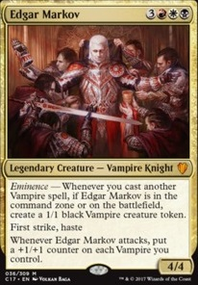 8: one real fun combo with gifts that I’ve seen is going for Haakon, Stromgald Scourge and Nameless Inversion for a funny boardwipe. Mana Leak seems pretty good to me. Having some interaction via counters might be beneficial. I would personally leave it in the deck. That might help you get some ideas. 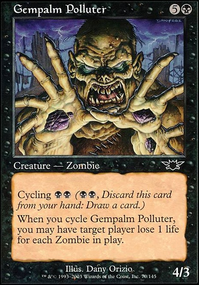 Nameless Inversion is a fine card, I think, but I’m not sure about it here. Basically, it can be used as a pump spell or removal. Using it as a pump spell here would kill most of the unblockable rogues you would want to use it on, so it would pretty much just be worse removal than most kill spells. Maybe in the sideboard, it would be alright. 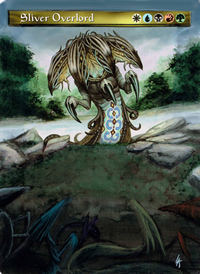 Thanks to GoblinsBeatElves and RedmundR2 i'm gonna add probably slither blade, bc it seems much better than the merfolk! Also i'm wondering if I should keep those Mana Leak or not in the deck... Btw, what do you thinkg about Nameless Inversion?